Artists and makers appreciating compost worms. By Erika Braccini, designer and recent graduate of Camberwell College of Arts, London, UK. The Gaia Cabinet is a movable furniture unit that contains soil and earthworms. 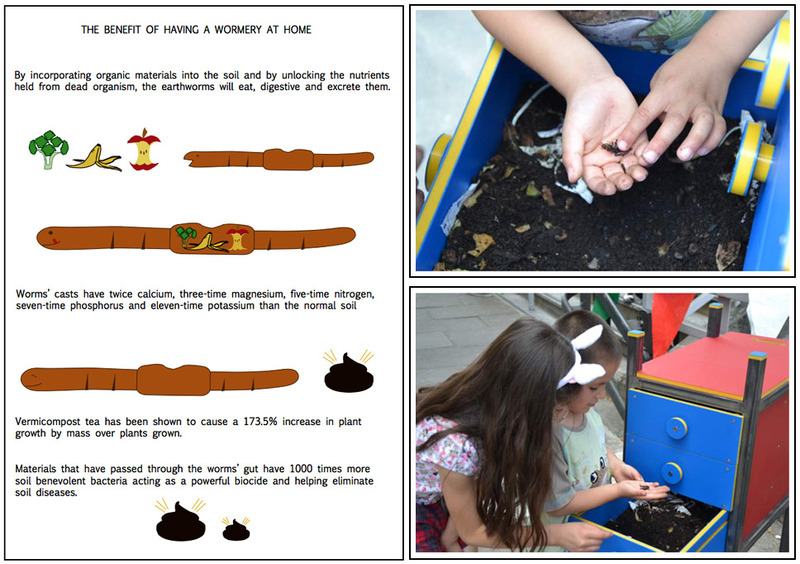 It has been designed to be brought around the city to schools to educate children on how important earthworms are, how important is to limit food waste, and to recycle it by feeding it to the earthworms, who will turn it into nutrients that will enrich the soil, making it 1000 times more nutrient. By using this enriched soil children are encouraged in planting and growing their own food, and by doing so learn how healthier food from highly nourishing soil is, and at the same time are also stimulated in being more connected with nature. By encouraging children, even on a small scale, in growing their own food, Gaia Cabinet can be the way forward in ensuring that children eat healthier food, therefore breaking the power of multinational corporations that control a big chunk of a food chain mainly made of non healthy and often GMO foods. In addition, Gaia Cabinet also wants to stimulate children and people in being more respectful of nature, and by getting in touch with the earthworms who have played an important role in our lives, could make children realise the importance of the environment that surrounds us and of preventing its destruction. The main purpose of Gaia Cabinet is to bring attention on important issues through play, positivity, happiness and colours instead of seriousness and gloominess. I believe that if important issues such as food waste, healthy eating, respect to the environment and the importance of earthworms for our lives are explained in a more playful and interacting way, children are more likely to understand the importance of them. I like to call myself an activist, environmentalist and happy designer, as I believe that design is a new form of positive activism that has the potential to become a powerful tool to tackle environmental and social issues. This is the reason why I decided to embark on a journey through the field of design and what has led me to graduate in three-dimensional design from Camberwell College of Arts in June 2014. In fact, I have faith that play, creativity, positivity and happiness is the way forward to tackle and overcome environmental and social issues. The design of the cabinet is fundamental for the project and for my ideals. Since this project is all about raising awareness on food waste, connecting and respecting nature, growing food and have a healthy and balanced diet, is also important that the product itself is coherent with these principles. Gaia Cabinet is entirely made with recycled plastic and stainless steel, both fully recyclable and locally sourced in UK. It is very easy to assemble and disassemble, therefore once its lifespan is over, it can be easily placed into the recycle bin, making it a truly zero waste product. The product is born from a thorough research on how to limit its impact on the environment, and be in line with the principles of a circular economy, an economy without waste where all the materials are going back into the system from where they were coming from. Gaia cabinet has already been tested at Rhyl Primary Schools, at the Assembly Community Centre and at Oliver Goldsmith Primary School (schools in London), as part of my research for my final major project. In an hour workshop I explained to children why earthworms are important for human lives, why is important to have a healthy diet and how to prevent food waste. I was letting children touch the worms so they could have a better understanding of them and explained them how to compost with worms. After the lesson on earthworms, compost and food growing, we were making simple clay pots together that I took back to university and fired, glazed and donated to them so they could start planting their own edible plants. The workshops have been successful as children were very happy to see me after a few months when I was going back to schools to bring them the pots. Teachers were happy and willing to have more workshops in the schools and engage with different age groups. The aim of Gaia Cabinet is to create a cycle within which every form of life will help and support each other, and provide a great ecosystem. Please visit my website at www.erikabraccini.com for more information about Gaia Cabinet project, a video of the project and images of the cabinet. My wormy torso sits in the kitchen and I feed her scraps of my daily life while another universe of life inhabits her ”guts”. The micro-biome that inhabits our own guts are as essential to the self we navigate through the world as the worms are to this artwork. I’m following an impulse to connect body and soil in a way that elevates ordinary dirt to the level of beauty and awe that is usually reserved for life forms above ground or far away in the celestial heavens. Worm Cozies are designed to help humans feel more comfortable hosting worms in their homes. 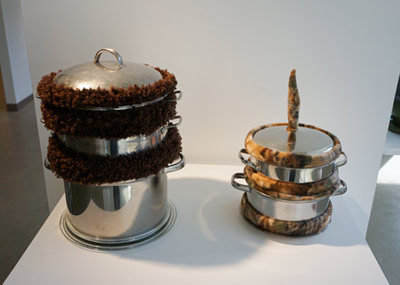 Based on the concept of appliance cozies, which were originally created as a way to hide the sight of garish machines inside the domestic space of the kitchen, these worm cozies similarly function as a softening interface that will help us get used to the idea of living with worm ecosystems. Composting worms are excellent co-habitants that can help us reduce our greenhouse gas output by eating waste paper and food scraps that would otherwise be sent to landfills, which generate methane. Local, in-home worms can transform domestic organic waste into a rich, nutritious fertilizer that can be fed to houseplants, food gardens, trees or lawns. Worm ecosystems are odor-free, silent and thrive in dark, moist places with food, so they will not want to leave their worm cozy. I understand that some people are squeamish about the idea of living with worms, which is why these cozies are designed to be friendly, fuzzy, and discrete. These pieces are on display in the Vermiculture Makers Club Exhibition in Louisville, Kentucky. I’ve made instructions on how to make the plant stand cozy so you can build your own. 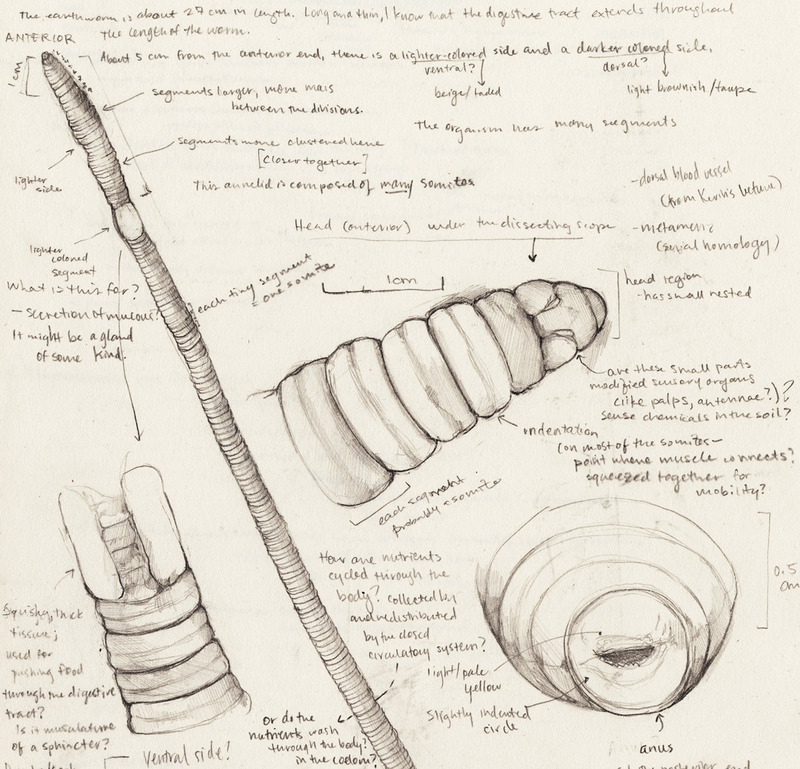 What happens when worms are engaged in the artmaking process? ~ We could not eat a cantaloupe without the work of the decomposers who make the soil on which the melon depends. ~ The cotton placemats depend on soils for the cotton plant to grow, and laborers for planting; plucking the seed fibers; spinning the thread; weaving the fabric; and designing and making the finished cutwork placemat. Setting the table: to provide all the things for a gathering of people to eat and drink together. Breakfast with Cantaloupe is about setting tables. The cantaloupe was for the red wriggler composting worms. They love the juicy parts of the cantaloupe. They were happy with their placemat habitat and stayed until they had eaten all but the lacey part of the rind. I wanted that part. They were my reliable collaborators. Back to the worm bin they went, and I to my meditations about tables, food, and labor. Ecologically indispensable, the earthworm is an intriguing organism both inside and out. With musculature and a digestive system that span its entire length, the earthworm’s activity in its environment contributes a slew of biogeochemical effects to the surrounding soils and local organisms. I took careful observations of its anatomical structures, particularly as they may relate to the worm’s physiology and behavior. Like many organisms that contribute to overall ecosystem health, the earthworm’s evolutionary lineage is intimately intertwined with its habitat. Understanding this valuable relationship allows humans to incorporate it into their own dwellings, overlapping the boundaries of modern human living with the natural world.